By the time you read this we will be well into the Easter season. Remember the powerful foot-washing on Maundy Thursday; the emptiness following the Friday celebration of the Lord’s Passion; the exuberance of the great Easter Eucharist? We certainly know how to celebrate our Lord’s great act of redemption. Yet we are reticent at sharing our exuberance with those who don’t share our joy of worshipping our Lord. Why? There is every indication that people want something extra in their lives. Most clearly believe in God even if they are not prepared to say so or maybe call Him by another name. This has been illustrated to me by a couple of things recently. First, one of the chaplains who accompanied the troops to the Falklands during the 1982 war recounted his experiences on Radio 4 including the necessary task of the proper burial of the dead out there. His description included the rather sad coincidence that the guardsman used in a training session in England, illustrating potential for having to bury comrades out there, actually became the first to be buried for real. He ended by saying that you don’t find many atheists in the trenches. When the chips are down, they are realising their need for God. Second is the reaction to the collapse and near death of Patrice Muamba during the FA Cup Tie between Tottenham Hotspur and Bolton Wanderers a few weeks back. There was no other player close to him at the time. He had had a heart attack. The immediate reaction of the players was to pray for him and to urge everybody else to do the same. Those prayers didn’t end with the immediate reaction of the players. Friends and other players kept appearing on television urging all of us to pray for Patrice. A minute’s silence was held at many grounds throughout the country the following Saturday - a massive silent prayer. The game itself was abandoned and has subsequently been replayed with Patrice able to watch the game on television. Prayers answered. The power of silence as a form of prayer was also used in the recent death of the Welsh football manager Gary Speed. Again, minute’s silences were held at many football grounds. I feel we don’t use silence enough in our worship and I was pleased to experience it during the Palm Sunday service while we waited for the procession from St Nicolas to arrive. I hope you feel the same way too. Back to our reticence. I believe people really do want something extra in their lives. There are many daily events we all experience from time to time that illustrate this. It’s not just high profile events to which this applies. Every day there are people experiencing desolation due to a bereavement of some kind. And bereavement isn’t exclusively the loss of a loved one. Losing a job or watching someone in pain and feeling helpless are both types of bereavement. And there are many more. Let’s see if we can be part of fulfilling the need of the bereaved, whatever that bereavement. There are already three Bible Study groups meeting regularly and a fourth group is considering whether it might be possible to start a prayer or study group. It has also been suggested that there might be a demand for a group meeting less frequently, perhaps monthly, to reflect on material that members have been looking at individually, such as a ‘Book of the Month’ or a short course of study material. The Education and Nurture Group will be thinking about this at their next meeting. Please contact Deacon Jennifer if you have any requests or suggestions. One of this Easter's highlights for me was going into St Mary's for the 11 o'clock Eucharist and just catching the end of the Celebrate! service. 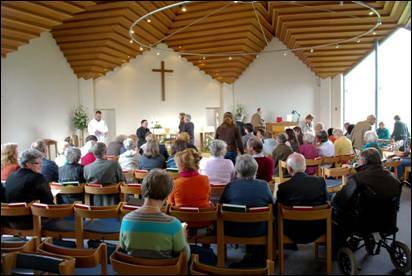 The Church was absolutely full of families and friends, very peaceful as Fr Daniel was giving the Peace. I also thought the Celebrate! Good Friday morning service was well attended and congratulations to all who contributed to these services, especially the singers, musicians and helpers. Well done. Of course another highlight for me was the Chrism Eucharist at the Cathedral - that really did make my heart sing!! 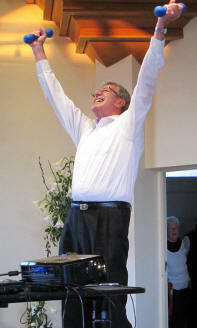 For many years now we have led 30 minutes of worship every Sunday afternoon at 5.00pm in Bay Tree Court. Once a month it is a communion service lead by me. On the other three weeks it is a Service of the Word with a set order of service with four hymns and prayers. There is a resident of Bay Tree Court, who is a Reader, and is always willing to help in some way. Our numbers are being depleted both in leaders and people able to play the piano for the hymns. It would be very sad if we had to reduce to a lower level of service. 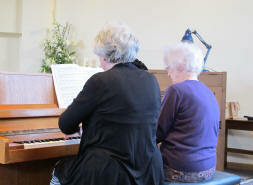 So we are looking for volunteers to lead or play the piano once a month at this service. Please contact any of the clergy if you feel you are called to help in this most important ministry. In any event, please pray that we shall be able to continue with a weekly service. 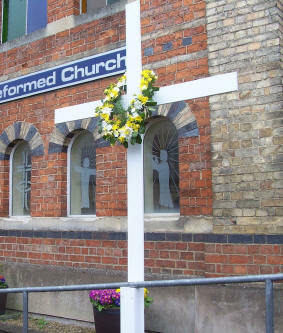 This Easter Prestbury URC again hosted the Parish Cross. Floodlit at night to make even more of an impact, the Cross is a reminder to the village that there is more to Easter than Easter Eggs. This year, the floral wreath was kindly made by Dee Graham. 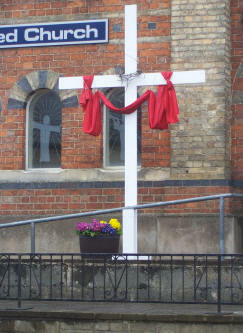 At the other end of the parish, similarly adorned, there was also a cross placed outside the north window at St Nicolas’ Church. 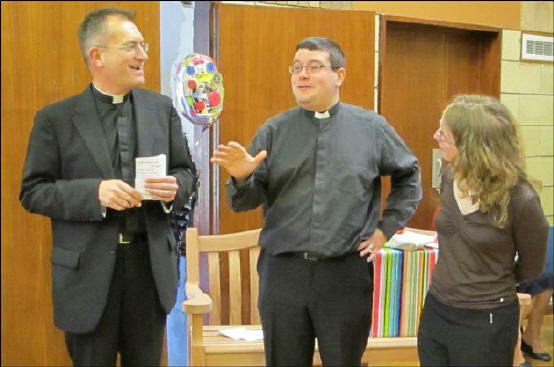 On Easter Sunday we bade farewell to Fr David and Sarah Gardiner. They had been with us since Petertide 2008 when Fr David was ordained deacon. A year later he was ordained priest. 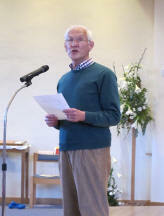 In the last year Fr David has had full responsibility for the congregation at St Nicolas’. Now he is to become a team vicar in Richmond. In customary style in Prestbury we had to have a party. There were tea and cakes galore! Fr Michael described how he first met Fr David and recalled several experiences. He thanked Fr David for all he had brought to us. Then came a marathon session of offering gifts, the writer lost count how many. Sarah and Fr David each gave a speech in return. The afternoon ended with a Service of Farewell when we prayed for God’s blessing on David and Sarah as they start the next part of their career. Father David leaving Prestbury will definitely leave a hole in the community, for he has been a part of so many people’s lives, and has played a vital role in the youth clubs across PPY. Personally, he has helped me to grow in faith and in so many more ways during his time here, and has put up with a lot of things, including being labelled with the nickname ‘Bertie’! I know that he will continue to help others throughout his life and will brighten up the community in Richmond greatly. I will never forget all that he has taught us and always have the hilarious and wonderful memories of his time with us. How very different from a cold wet windy November morning! 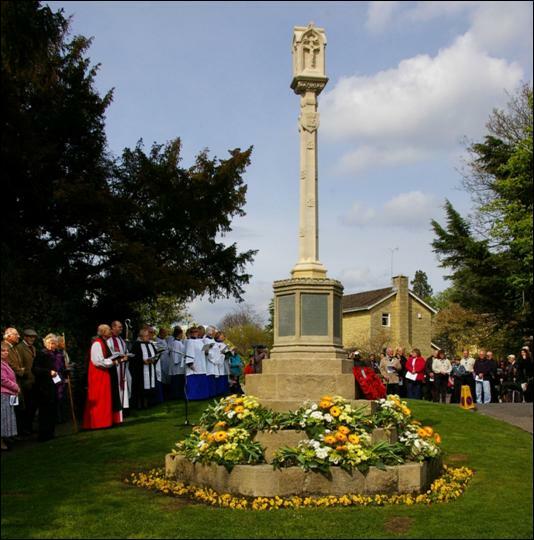 It was on a warm and sunny afternoon in April that we gathered round Prestbury War Memorial for its rededication. Following damage by vandals last autumn the restoration has been carried out by Meister Masonry as a gift to the community of Prestbury; we thank them for their generosity. The Bishop of Tewkesbury, the Right Reverend John Went, led the service, assisted by clergy from St Mary’s, the United Reformed Church and Holy Name Hall. Bishop John talked of war and the continuing need for peace in many places in the world today, but said there are also times when we must fight: against evil, against injustice. He prayed too that the memorial, raised again from broken pieces, would stand as a reminder to us of Christ’s resurrection. The names of those who are commemorated on the memorial were read out, and a piper played the lament ‘Flowers of the Forest’. Representatives of the Royal British Legion laid wreaths and presented colours. The Mayor of Cheltenham and local dignitaries were also present. The service concluded with the National Anthem and a blessing. 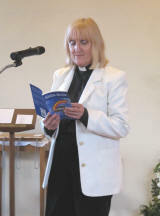 At the Annual Meeting of Parishioners held in St Mary’s Church on Sunday 22nd April Janet Ford was elected to serve as churchwarden at St Nicolas’, filling the vacancy left by Liz Greenhow. 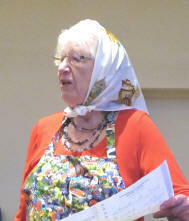 Margaret Compton was re-elected to serve for another year. 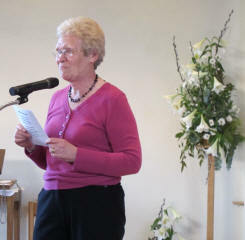 Margaret Holman and Mary Turner were re-elected to serve at St Mary’s. St Nicolas’ Church is normally almost full to capacity but that is on a Sunday. This was Saturday evening on the occasion of our ‘Evening of Entertainment’. The event more than lived up to its name inasmuch as the audience was treated to a variety of local talent in all respects. It is always surprising how much of the above mentioned talent is possessed by those of us residing within our parish and the immediate area . It is not appropriate to single out individual performances because each act in its own way was well executed. 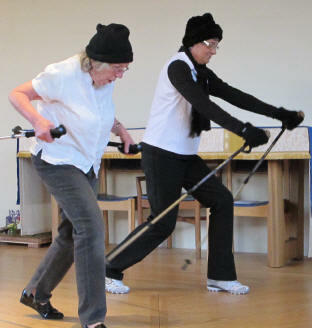 Entertainment ranged from: piano duets, a violin solo piece, an Ivor Novello song for soprano, Nicolympics performed in black and white by members of the SNADS players plus extras, recitals of verse and much more. Thanks go (or is that goo) to the organising committee for arranging this event and may we look forward to the next one. 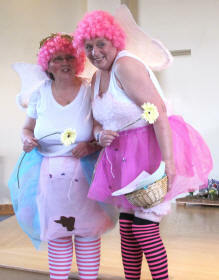 What a lovely ‘fun’ evening at St Nics on 14th April - we were entertained with a variety of acts - you people have hidden talents!!! The take on ‘The Artist’ - was brilliant and so amusing - the sketches were amusing and the readings were good - particularly the Forest of Dean ‘Paradise Lost’. All culminated in a rousing rendition of ‘Land of Hope and Glory’ à la Last Night of the Proms!!!! Please, can we have more of these evenings? 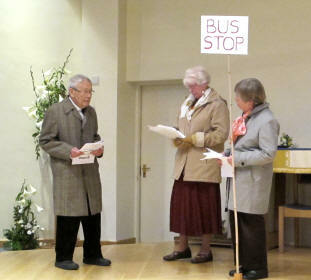 It was well supported and received by a good audience - some churchgoers, some not. Thank you. There is still time to sponsor Stephen Murton on his coast-to-coast walk in aid of Prestbury and Pittville Youth, and the Friends of St Mary's. Please see him at the various church services or Parish events, or alternatively you can contact him by email with your name/address/postcode, amount and Gift Aid option. Most people who visit the Shrine of our Lady of Walsingham do so to attend one of the big festival events, or to make a pilgrimage that follows a time-hallowed sequence of worship and devotion at the Shrine. For a different experience, why not try Walsingham Bible Week? Five days of biblical teaching and spiritual renewal in the company of other Christians. This year’s topic is ‘The Profound Mystery – Christ and his Church’, exploring the letter to the Ephesians. Bible Week will take place during the October half-term, between Monday 29th October and Friday 2nd November, and includes a programme for children and young people. The cost covers four nights’ accommodation and full-board, from Monday evening meal to Friday breakfast (£198 for adults; children under 16 and students: £90). Deacon Jennifer has attended previously and will be happy to provide further information. Enquiries about Bible Week can also be made directly to the Shrine - telephone 01328 824204. To book contact the Hospitality Department, The Milner Wing, Common Place, Walsingham NR22 6BP; email: accom@olw-shrine.org.uk; tel: 01328 820239. Members and friends of Prestbury Flower Arranging Club enjoyed a really interesting talk by Yvonne Mort on Pressed Flower Craft back in March. Yvonne has been making cards with pressed flowers for many years and selling them very successfully to raise large amounts of money for charity. 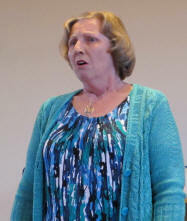 She treated us to a most amusing evening and was glad to receive a cheque for £50 towards her fund-raising. 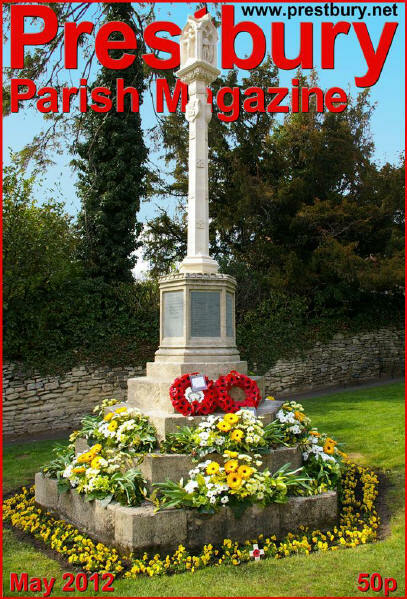 Friday 4th May is National Flower Arranging Day and we hope to place an arrangement in the window of the Prestbury Village Stores, so do look out for it and perhaps think about joining us for our Social Evening at Prestbury Hall on Bouncers Lane on 21st May. The hall is open from 7pm with our meeting starting at 7:30pm. It will be an opportunity for us to do some hands on arranging when we attempt to arrange a floral ‘cake’ to celebrate the Queen’s Diamond Jubilee. Visitors are welcome to join us and join in at a cost of £5 or just come along for a chat, a slice of cake and a cuppa. On Saturday 26th May at 2pm Mrs. Joan Britton is hosting a fund-raising afternoon tea at her home, Cornerways, Bushcombe Lane, Woodmancote, to which members and friends are cordially invited. 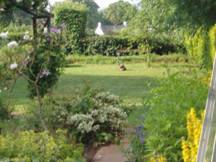 Joan has a really lovely garden which is well worth a visit and there will also be a bring-and-buy stall. If you would like any more information on up and coming events do have a look on our website www.prestburyflowerarrangingclub.com or contact Lindsey McGowan or Fenella Botting. The Quiet Garden Trust was started in 1992 in Stoke Poges, Buckinghamshire, and has since extended all over the British Isles, and to other parts of the world. The movement consists of people who want to share their gardens or space with others, for the purpose of being quiet and reflecting on the things of God such as His creation. They can spend this time in prayer, Bible reading, drawing or painting, or just relaxing, they can also bring someone else with them to share this time. If you are interested and want to know more and perhaps book a time, please visit www.quietgarden.co.uk or contact me. This article refers to the printed magazine and our previous editor of over 13 years, Frances Murton. She usually had a page of her own entitled "Editor's Corner". It is not until someone leaves that we fully appreciate all that has been done for us as we notice the void. Fr Michael and the rest of the clergy already feel the absence of Fr David as they try to juggle their rotas to cover all he used to do. I am already noticing the void left by Frances as I get to grips with preparing this magazine. Many documents and templates were handed over in the past few months and as I look through them I can see much to be admired in the way Frances organised herself and the magazine material. I also wish to add my ‘Thank you, Frances’. For this edition Kate Giles has helped me. We have broadly followed the familiar style Frances set. Frances had a way of nudging people to submit those time-sensitive articles in the right month. I’m missing that. Perhaps you are the person to take on that role in your congregation. It is not too late to push yourself forward to join the new magazine team. There is plenty to do. There will be changes in the way the magazine appears. Some you will readily take to; some will grow on you and some you may find hard to accept. Change it must. The new team will have to have the confidence to develop the magazine in its own way. We are still uncertain who will make up this team. In the meanwhile please continue to follow the instructions at the foot of this page. As the webmaster I can easily change who is on the receiving end of our email address. Please do not be surprised if an unfamiliar name replies to you! Whatever you think, why don’t you write in to the Editor to make some comments or suggestions of what you might like to read about in your magazine? The flowers arranged by Lindsey McGowan at the War Memorial looked so lovely I thought you would like to see them twice. Often, in her corner, Frances used to share a thought with you. Here’s mine. Recently I needed to collect a key from someone who was soon to be going out. He told me he would hide it in his garden and told me where. When I got to the right bush it took me a long while to find the key even though I knew it must be there. Anyone not having been told would have had no idea there was a key. Afterwards I thought, is this not like the way only some of us find God? The Friendship Group has just had its first coach trip of the year which was a great success. We went to Avening on the most beautiful afternoon in March, and had a superb tea there. I am pleased to announce that the next outing will be on July 4th to Westbury-on-Severn, and for those who really like to ‘plan ahead’, on September 26th we will be going to Naunton. All our trips include a scenic coach ride to the venue, followed by a scrumptious tea provided by the local WI. A stall is usually set up to tempt us all with their home-made produce. Apart from the coach trips, the Friendship Group also visits the over 80s on their birthday with a small gift and card. It is not very often that I miss a church football game. However, on the 24th March I did, to go to a meeting at the Birmingham Hilton. This meeting was about Noonan Syndrome from which I suffer. I had not been to one of these meetings since I was about six years old. I was diagnosed with Noonan Syndrome at the age of four. Not many people know about Noonan Syndrome although the number of people in the UK with it is comparable to the number with Down’s syndrome. Noonan Syndrome is a genetic disorder which can cause many different type of problems, which include heart abnormalities, restricted growth, muscle and bone problems, such as scoliosis, and sometimes learning difficulties. Most people with this syndrome have a similar facial appearance, especially when they are young. The Noonan Syndrome Association aims to help people with Noonan and their carers, as well as supporting medical research and improving awareness of this condition. I found the meeting very interesting and talked to other people with the same condition from many parts of the UK, including our south west region. I am looking forward to meetings in the future. The GHCT helps some of Gloucestershire’s churches by giving money to help with repairs and upkeep. In 2011 grants of £100,000 were awarded. Annually the trust holds a ‘Ride and Stride’ event to raise money. Last year some 296 participants from 101 churches raised £38,638. 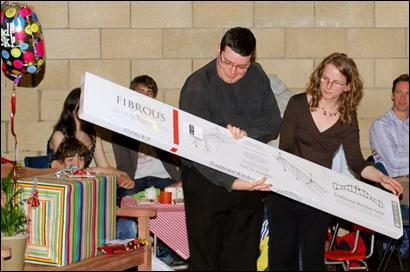 The amounts raised by the churches were from modest levels to nearly £2,000. This may sound impressive but does not go far when considering the sizes of grants needed. In fact, this is the lowest total for some years. Generously sponsor the riders and striders. The money you raise is shared equally between the Trust and any church of your choice. So there is a double incentive! 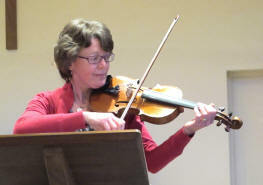 See Nigel Woodcock in St Nicolas’ and Phil Dodd in St Mary’s for further details. O LORD, I have heard of your renown, and I stand in awe, O LORD, of your work. In our own time revive it; in our own time make it known. Habakkuk is one of the ‘minor’ prophets, one of the sequence of very short books tucked in at the end of the Old Testament. It is only the books’ length, or lack of it, that makes them ‘minor’; in life, each of these prophets was a force to be reckoned with, as he delivered to his people the word of God for his own time. Yet here we have such an unconvincing beginning to a piece of prophecy! ‘Lord, I have heard of your renown ...’. No more than that? Who will listen to a prophet who can only say he has heard about God? Habakkuk’s was a smaller world than ours, but just as troubled. The mighty Assyrian empire, so long the dominating force in the region, was crumbling before the rising power of Babylon. The whole region was threatened by the ruthless onward march of the Babylonian army, and the little state of Judah lay in its path. The Babylonians ‘all come for violence ... they transgress and become guilty; their own might is their god!’ (Habakkuk 1:9, 11). Closer to home, there was little comfort: injustice was the rule, and things were a long way from the righteous and compassionate society which the Law demanded. Habakkuk dares to ask God, ‘Why? Why does God allow this?’ He knew so well the stories of his nation’s conquest of Canaan, of David’s victories over all Israel’s enemies. Then, God had been active to bring his people victory. Now, ‘when the wicked swallow those more righteous than they’ (1:13) why does he not act again? Yet in spite of all, Habakkuk never doubts that God is still righteous, that he still cares for his people, and that he willingly hears the passionate complaint of his prophet. Did Habakkuk finally get his answer? Not the one he wanted, or thought he wanted. There was no comforting assurance that Judah would be saved from the Babylonian war-machine. But as he persists in his struggle to understand world events under the gaze of God, something fundamental changes for him; he is able to give expression to his faith in a psalm of total confidence: ‘Though the fig tree does not blossom and no fruit is on the vines ... yet I will rejoice in the Lord, I will exult in the God of my salvation.’ (3:17-18). In his courageous honesty, even (especially?) in his prayers, Habakkuk can be a role model for us. Today’s world gives us plenty of reasons for asking questions: so many natural disasters, so much injustice, so much suffering. When we pray, it can be tempting to avoid asking the hardest questions, for fear of angering God, even perhaps of finding that God has no answer. But God is ‘always more ready to hear than we to pray’ and we should not back away from asking questions. Like Habakkuk, we may need to wait for an answer, but we should not stop listening. One of the suggestions made at our Vision Day was to organise walks as a way of socialising and sharing fellowship. Consequently on Monday 7th May I will be leading a 5 mile walk in the Beckford / Overbury area. There are good views and a nature reserve to enjoy. The walk involves a few gentle inclines and four stiles (two are the trickier dry stone wall type) but it should be manageable by most people and, I hope, a lot of fun; and with me leading it the pace is guaranteed to be steady! We will meet in the car park at St Nicolas’ and share cars to the Beckford Inn. We will leave the car park promptly at 9:30a.m. Afterwards there will be the opportunity to have lunch at the Beckford Inn. I do need to know numbers for this and people’s orders by 3rd May. You can view the lunch menu at www.beckfordinn.com or contact me if you don’t have access to the internet or if you have any queries on 01242 678458. I do hope I can entice a few of you to dust off your walking boots. Last month I asked for new collectors to replenish the stalwart band who have been collecting for many years. Each year, for one reason or another, people have to drop out, leaving us with a decision whether to leave the round uncollected or load it onto another collector. If you are not already collectors please come forward and offer to help by contacting me. I do not want to have to twist arms in order to cover the village streets. Thank you. Our next meeting is on Tuesday 22nd May at St Nicolas’ Church at 7.30pm. 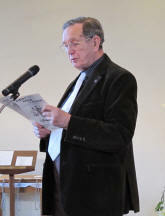 A Taizé evening is planned which will be conducted by John and Hilary Gann. Everyone is very welcome to come to participate and relax and enjoy. A total of £130 has been sent to Care International to be quadrupled by the European Union Match Scheme. £50 of this has been donated from our Sunday refreshment profits. The proceeds of our next bakestall on 20th May will be given to Christian Aid. This charity event will be held on Sunday 3rd June, from 10am – 4pm, at Newlands Park, Southam, by The Rotary Club of Cheltenham in association with Cheltenham Rugby Club. The big event will be a Decathlon, and individuals over age 18 are invited to register to come and take part in ten events during the day: football shootout, long jump, target golf, welly throwing, skittles, basketball, gymnastics, shot putt, sprinting and rugby kicking. There will be cash prizes for the winners. It will be a Family Fun Day, with BBQ and refreshments, children’s activities, many stalls and attractions, and a chance to watch and cheer on the ‘athletes’. This will be a sponsored event and all proceeds will be shared between Teenage Cancer Trust, Life Education Trust, Caravans for Schools, Shelterbox and other Rotary charities. 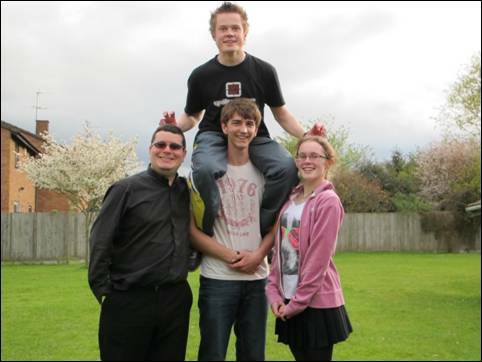 Prestbury's Jubilee Event on June 4th is now calling for entries to ‘Prestbury’s Got Talent’!! Open to all ages, individuals or groups. Please contact to get your talent showcased! Following Graham Pearson’s well-received talk last year on the life of Lawrence Johnston and his role in the creation of Hidcote Manor Garden, we are planning a visit to Hidcote Garden on 15th June. The idea is to travel by coach (to arrive at 2:30 pm) to have an introductory talk by one of Hidcote’s garden experts and then visit the garden itself. Hidcote is a National Trust property, therefore National Trust members do not have to pay for the visit itself. The price of the trip is £15 for National Trust members and £25 for non-members. There are facilities at Hidcote for teas and refreshments. Tickets are available from Jim Mackie. It would be a help if those interested in coming could let me know reasonably early in order that we can make arrangements for the coach, the talk and (possibly) wheelchairs. After being rested last year, the pilgrimage is back with a new look here and there and will take place on Saturday 16th June 2012 with ‘All for Jesus’ as its theme. The programme still looks familiar, with the Solemn Mass of Jesus Christ, the Universal King, as the central act of worship for the day at 12:00 noon. For those who have missed it in recent years, the afternoon procession has returned as the Procession of the Blessed Sacrament to the Abbey for Solemn Benediction. More details can be seen on the pilgrimage website: www.glastonburypilgrimage.co.uk . I hope that Glastonbury may welcome pilgrims from the North Cheltenham Team once again. A North Cheltenham Team Pilgrimage to the Shrine of our Lady of Walsingham is being planned for the May Day Bank Holiday Weekend 2013, i.e. from Friday 3rd May until Monday 6th May 2013. 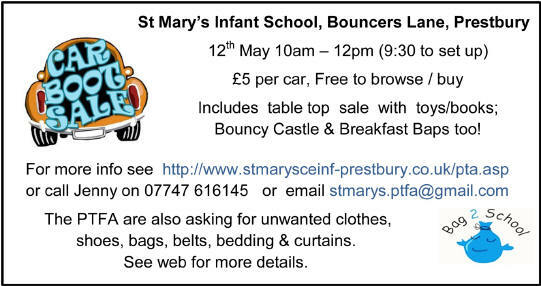 To secure one of the 20 places booked, please send me a deposit of £10 (non-returnable) as soon as possible. (A further deposit of £20 per person will be required 12 weeks in advance of our pilgrimage) If you would like to know more about Walsingham (the shrine, accommodation, sample programme, transport, cost), please contact me. Booking forms and more details will be available later in the year.